The first Porcupine first appeared in Tales to Astonish #48 (October 1963), and was created by Stan Lee and Don Heck. The second Porcupine first appeared in Daughters of the Dragon #3 and was created by Justin Gray, Jimmy Palmiotti, and Khari Evans. Alexander Gentry was originally a scientist who worked as a weapons designer for the United States Army. He conceived the idea of designing a battle-suit in imitation of a porcupine: it would be covered with quill-like projections for defense. Moreover, it would be able to shoot its quills, or gases, flames, chemicals, paralysis-inducing pellets, or weapons from quill-like tubes, at an opponent. Gentry spends months working overtime to create his porcupine battle-suit. He is proud of his achievement when the suit was finished, and believes his invention is worth a fortune. Yet Gentry also believes that the government would pay him, one of its employees, virtually nothing for his creation. Angrily, Gentry decides to keep the porcupine battle-suit and to use it to become wealthy through crime. Thus Gentry became the Porcupine, one of the first costumed professional criminals of his generation. Hank Pym, who was then the original Ant-Man, and his partner, Janet van Dyne, the Wasp, soon defeat the Porcupine while he attempted to rob a bank. However, the Porcupine succeeds in escaping. After Pym had also assumed the superhuman powers and identity of Giant-Man, Porcupine returns for revenge. During the resulting battle, the Porcupine consumes what he thinks is a Giant-Man growth medium, but which instead shrinks him to microscopic size. Eventually, however, the capsules' effect wore off, and the Porcupine, again at his normal size, is among the many costumed menaces assembled by Doctor Doom to disrupt the wedding of Reed Richards and Susan Storm. His self-confidence still shaken by his failures in battling Giant-Man and the Wasp, the Porcupine eagerly accepts the invitation of Count Nefaria, a powerful figure in the criminal Maggia, to join his group of costumed agents. 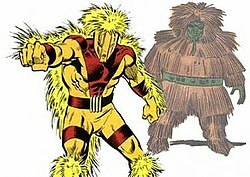 Among Nefaria's agents are Plantman, the original Eel, the original Unicorn, and the Scarecrow, all of whom the Porcupine would ally himself with in the future as well. The Porcupine and the other costumed agents aid Count Nefaria in his attempt to hold much of Washington D.C. for ransom. However, the X-Men thwart Nefaria and his agents. Once again, the Porcupine escapes being taken prisoner, and he blames the failure of the blackmail scheme on Nefaria and the other agents. Gentry comes to suspect that in fact, he himself was inadequate for the role of being a "super-villain" battling superhuman opponents. It is not known what the Porcupine did between the end of this venture and his enlistment as a member of Batroc's Brigade. As a Brigade member, the Porcupine unsuccessfully battles Captain America. Months later, the Porcupine and his allies, Plantman, the original Eel and the Scarecrow, go to work for the masked criminal mastermind who calls himself the Cowled Commander on his crime spree. Once again, the Porcupine clashes with Captain America but is defeated. Convinced that they are failures, Gentry and Leopold Stryke, the original Eel, seek guidance from the Celestial Mind Control movement, which is secretly masterminded by the alien Nebulon. Nebulon pits the Porcupine and the Eel against his foes, the Defenders, who defeat them both. The Porcupine is then employed by the android Zodiac to participate in a crime spree. Porcupine is then employed by Justin Hammer to battle Iron Man. Later, the Porcupine and a small group of confederates invade a major Manhattan hotel to steal the valuables in its safe. The Porcupine decides to rob the wealthy attendees at a fashion show in one of the hotel's ballrooms. The show is being given by fashion designer Janet van Dyne, who is also the Wasp. Henry Pym, who now uses the costumed identity of Yellowjacket, is also present, as is Kyle Richmond, the adventurer called Nighthawk. The heroes swiftly defeat the criminals. Porcupine feels humiliation at being taken down by opponents the size of insects. Tired of his long string of defeats, Gentry decides to give up his career as a costumed criminal and live off the millions of dollars he expects to receive by selling his battle-suit. Gentry totally redesigns his porcupine battle-suit, making it far deadlier than before. He enters into negotiations with the subversive organization called the Secret Empire to sell them the suit. The Empire requests proof of the battle-suit's capabilities, so Gentry attempts to prove it in battle against Captain America. Captain America and his ally Nomad defeat the Porcupine, and Gentry is returned to jail. When most of the heroes were missing due to them partaking in Beyonder's Secret Wars, Porcupine joins Batroc and some other villains in fighting Moon Knight and Guardsman. Porcupine later joins a short-lived version of the Lethal Legion in their mass-attack on New York's superheroes. He is knocked aside by a thrown printer and hit by a stray blast from Unicorn. Gentry then tries to sell the suit to AIM, HYDRA, the Kingpin, the Maggia, the Tinkerer, and finally to the Serpent Society, but almost no one wants it, and the few offers he does receive for it are insultingly low. Despairing, Gentry comes up with the idea of selling the battle-suit to the Avengers to prevent it from falling into the hands of their enemies. Captain America is intrigued when Gentry mentions he contacted the Serpent Society, whom Captain America has been trying to bring to justice. Captain America agrees to have the Avengers buy the battle-suit if Gentry helps get him to members of the Serpent Society. Gentry accepts Captain America's terms. Captain America's plan is for Gentry to pretend to have captured him and offer the Serpent Society the opportunity to kill him. Gentry contacts the Society and arranges to have some of their members meet him at a lower Manhattan construction site. When the trap is sprung, in the ensuing melee Gantry trips and inadvertently impales himself fatally on one of his quills. Captain America has Gantry buried in a grave reserved by the Avengers for those who have fallen in battle, and puts his battle-suit on exhibit in Avengers Mansion, labeled "Battle Armor of the Porcupine – Honored Foe of the Avengers". Porcupine pops up as one of the character witnesses for Trapster's lawsuit against Tinkerer. During the in-court brawl, She-Hulk notices Porcupine and reminds him that he is supposed to be dead. Realizing She-Hulk is right, Porcupine drops down dead. A person using the Porcupine identity and battle armor appeared in Daughters of the Dragon #3. Porcupine and other villains are attacked by Colleen Wing and Misty Knight, who were seeking information in the bar. Porcupine is quickly felled and thrown into Doctor Bong. During the Civil War event, he is apprehended alongside Eel in San Francisco by the three rookie Beetles and their leader, MACH-IV. This group forms Thunderbolts Team A. The Porcupine appears again in Thunderbolts #107 alongside the likes of the Eel, Doctor Octopus, Boomerang, Whirlwind and others who in separate teams of the new Thunderbolts face massive hordes of empowered people. These were everyday people empowered by an out of control cosmic source of energy called the Universal Well Spring. The Thunderbolts entry in Volume 12 of the Marvel Universe A-Z Handbook hardcovers reveals the new Porcupine's real name is Roger Gocking. During Doctor Doom's war with Wakanda over their Vibranium supplies, Porcupine was employed by former Damage Control worker Walter Declun in Mexico to defend one of Doctor Doom's outposts there from the Dora Milaje and the Fantastic Four. Porcupine then begins attending Super Villain Anonymous meetings held in the basement of St. Jude's Church. Some time later, Porcupine is forced into committing crimes for his ex-wife, Olivia, who had retreated to a safe haven for physically and emotionally battered women because she could not take the stress of Roger's lifestyle. She uses their daughter, Kalie, as a hostage to force his compliance. After his loved ones are located, Gocking decides to reform, and begins traveling across the United States, solving crimes with Spider-Woman and Ben Urich. Once Spider-Woman's baby Gerry is born, Roger also becomes his nanny. Hoping to sever his criminal ties, Porcupine asks Hobgoblin to release him from his franchise contract and let him buy the Porcupine equipment outright. Instead, Hobgoblin tries to kill Porcupine with a Pumpkin Bomb so that he could use his equipment for future franchisees. Roger happens to be wearing one of Spider-Woman's high-tech pregnancy outfits, enabling him to survive the bomb, and he begins a relationship with Spider-Woman. The two continue looking after Gerry, who they discover also has Spider-Woman's powers. A relatively normal teenager before manifesting his powers, Billy inadvertently killed a group of human patrons at the Cafe Des Artistes who were harassing the mutant waitress Sylvie, on whom he had a crush. He took her "hostage" which led to a police standoff. Rather than allow the situation to become a catalyst for anti-mutant strife in Mutant Town, and because one of Billy's victims was one of the leaders of the Louisiana chapter of Purity, Alexei Vazhin hired Sashenka Popova to assassinate Billy Bates. Vazhin then paid Sylvie and her father off to keep them quiet about the incident. While he never officially took the name "The Porcupine," Billy intended to use it as his superhero name. The original Porcupine designed a suit of battle armor for himself composed of steel and advanced plastics that enhanced his strength and durability. The armor is equipped with a wide variety of offensive and defensive weapons built in. The outer surface of the armor is covered with razor-tipped metal quill-like projections which can be fired at opponents. The armor's other capabilities include laser beams, concussive bombs, small rockets, tear gas, sleeping gas, smoke screens, acetylene torch flames, liquid cement, wheels giving off hypnotic lights, and high voltage blasts of electricity. The battle-suit included belt jets which allowed him to fly for short distances. Gentry was a skilled automotive mechanic, and had a master's degree in engineering. The second Porcupine's armor gives him some resistance to physical and energy attacks. The helmet has a 6-hour air supply and night vision lenses. The quills do damage when striking opponents. His boot jets allow him to fly for up to 10 minutes. The Porcupine can fire three bombs or three knock out gas bombs at once. Billy's offensive morphing power allowed him to sprout razor tipped spikes from his face, body, and right arm. These spikes were retractable, distorting the skin tissue to appear as acne. He could fire these spikes as projectile bolts with lethal force. Billy could also distort his left arm into a misshapen, extended form with elongated fingers and claws. In the House of M reality, William Bates was killed by Shashenka Popova when she stabbed him when William was trying to prevent her from fleeing the scene of a Sapien League attack. In Ultimate Spider-Man episode "Doomed," there is a female version of Porcupine named Lady Porcupine that is on the S.H.I.E.L.D. 's Most Wanted database and had been defeated by Spider-Man.